Anthony Plog’s catalog of works for trombone solo continues to grow, and his well-crafted, accessible music finds its way on recital programs of both students and professional players. Initiatives was composed at the request of M. Dee Stewart, Professor of Trombone (retired) at Indiana University, who commissioned a series of solo works for brass instruments (trumpet, horn, trombone, bass trombone, euphonium, tuba) for use by the College Auditions Preparation (CAP) program at the Jacobs School of Music. It is refreshing to see a highly regarded composer like Plog write music for young players; these days, too many commissions are for works that can be played only by elite level performers. 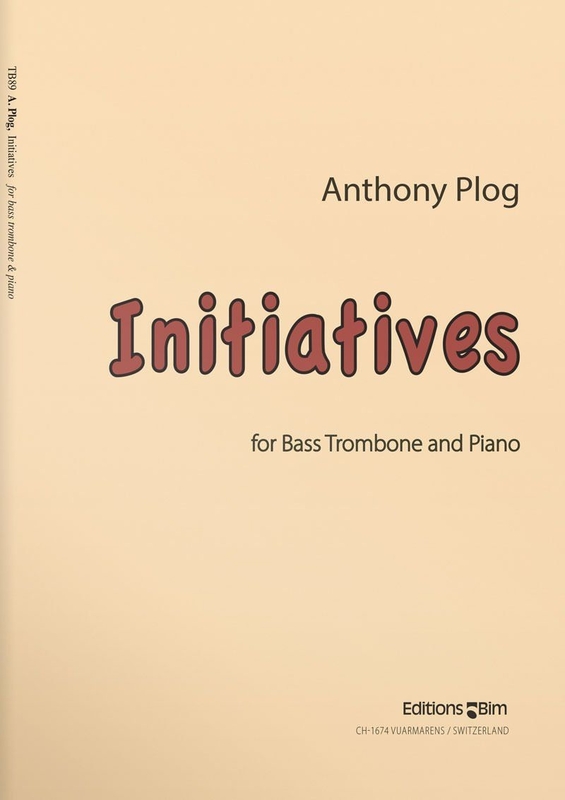 Initiatives opens with a slow, unaccompanied line for the soloist; when the pianist enters, harmonic and rhythmic material that will be developed in the following Allegro section is introduced. The bulk of the work consists of rhythmic ostinatos that are traded back and forth between the soloist and accompanist and Initiatives closes with a reprise of the opening material. With a range of E to c1, Initiatives does not require the use of an f-attachment, much less a double-valve bass trombone, although an f-attachment certainly would facilitate ease of movement between many notes. Younger players will benefit from working on its long lyrical lines, and the chromatic, articulative, and rhythmic interplay between bass trombone and piano provides the opportunity for collaborative development. The publisher includes useful instructions about the rules for notating accidentals in the piece; other publishers would do well to follow Edition Bim’s lead in this in order to avoid confusion. Initiatives succeeds as a fine work for the developing bass trombonist and it proves that a work of quality does not need to be overly complex to be satisfying as both a pedagogical tool and a vehicle for artistic expression.